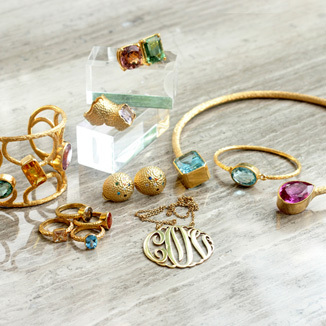 The Jewelry Headed by Elena Bautista, MiaBella front lines their high quality pieces and materials comparable to those from abroad; paired with options to customize items, clients are given the avenue to have jewelry tailor made for their preferences and personalities. Inspired by the people around her, Elena makes sure that her jewelry pieces are relevant, not only to her, but also to the wearer. She makes sure that each design reflects versatility, wearability, and value for money. She has always used gold as the main metal in her jewelry, but for her recent collections, she explored other materials, such as silver and brass. MiaBella's craftsmanship banks on talent and experience, with goldsmiths who have been with them from the day they started; they continue to create handcrafted jewelry that justifies the worth of one’s money.